The winter months in between club and high school seasons are the ideal time to focus on individual development and add goalkeeper specific training into your schedule. This is a time of the year when we typically have more time to address our position specific needs that we may not get as much attention during season in the team environment. CLICK ON THE BANNERS TO REGISTER NOW! We are excited to announce that Dynasty is now offering a new YOUNG GK Winter Camp for male and female goalkeepers ages 10-14 in Raleigh, NC on January 14-15, 2017. This camp will be a fun and competitive environment focused on developing a sound technical foundation for young developing goalkeepers while fostering a passion for the position. It will consist of two training session a day with a lunch/lecture in between to discuss tactical aspects of the position and cover the essentials of sound nutrition for athletes. In addition the 9th Annual Winter Camp in Sparks, NV is just around the corner, and only a few spots remain in the YOUTH GK Clinic for goalkeepers under 14 and in the older ELITE GK Camp, so don’t delay registering if you are considering attending. Camp is limited in size to 12 students to guarantee plenty of training for each goalkeeper. It is a day camp structure open to BOTH male and female gks. The YOUNG GK Clinic will train twice over the weekend for 2 hours (once each day), while the ELITE GK Camp will include 2 lectures and four 2 hour+ training sessions, for a weekend of fun and intense training at the Golden Eagle Sports Complex in Sparks, NV. If you are interested in registering please click on the banner above and/or call Tracy at 919-942-2903 if you have any questions. 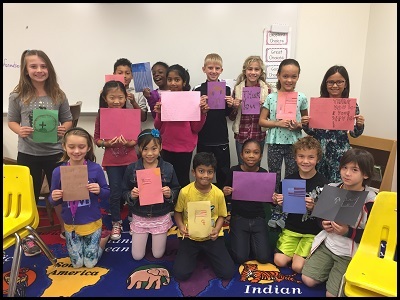 In addition to the Camp Homework I assign students every year, I also challenge my camp students to become involved in their community to raise their awareness of the global community around them. It is far too easy to get swept up into our busy lives, the daily grind, and our own microscopic circle of influence. I am certainly a culprit of that. Hence the Dynasty Goalkeeping Community Outreach Challenge was developed to get all of us to broaden our circles of influence! 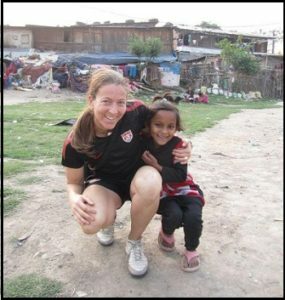 Initially the program began with students donating gear for children in need around the world and has grown from there. Thus far Dynasty has been involved with the following organizations Carolina For Kibera, Coaches Across Continents, They Often Cry Outreach (TOCO), Equipment Across Continents (a branch of Coaches Across Continents), the U.S. State Department (cultural exchange and female empowerment programs), Sports United (a cultural exchange program organized through the U.S. State Department. In 2010 the Dynasty Goalkeeping Community Outreach Challenge took our generosity one step further. I challenged students to ACT BEYOND THEMSELVES and get involved with a project that meant something to them and to ‘donate’ some of their TIME to help others. The feedback I received from the students and parents was tremendous, so giving back to your community has become a core value of the Dynasty family of goalkeepers. It is in acting that we have our most profound effect, because there simply is nothing more valuable than your time. So to set aside some of your precious time to help another human being (animal or the planet) speaks volumes. The recipient will certainly be tremendously grateful for any help you can give, but the effect it will have on your own life will be were the most value lies. The gratitude and love you receive back from the people you help is addicting and powerful. Try it and you will see what I mean. Here is the list of the volunteer work that Dynasty staff and students (listed by the camp week they attended) reported in 2016! This is GREAT STUFF! I am proud of all of you — you guys inspire me to do more!!! If you were a 2016 student/staff that did volunteer this year and your name isn’t on this list it is because you didn’t email me! I can’t report on something I don’t know! 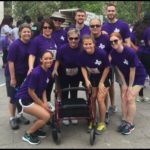 Raised money & awareness for Lupus by participating in Walk for Lupus with her mother. Carly has continued her service oriented work with a 501(c)3 organization called Back on My Feet. This is her second year with the organization. 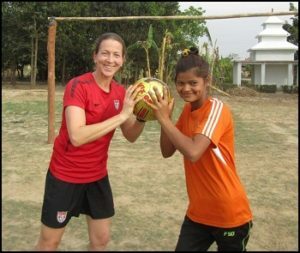 My latest volunteer work with the U.S. State Department program Sports United brought me to Asia – Kathmandu, Nepal to be exact! This was my fifth trip as a sports envoy (Guatemala, Ukraine/Poland, Costa Rica, Fiji/Tonga) and I think my furthest yet! On this adventure I was excited to be partnered with my 1999 Women’s World Cup teammate, and fellow UNC alumnae, Lorrie Fair. Our week was packed solid with clinics, panel discussions, speeches, and video shoots all around Kathmandu as well as a quick flight (day trip) out to the Far West of Nepal in Dhangadhi along the border with India. Lorrie and I were fortunate to be able to interact and connect with girls and boys ages 3-22 from various socio-economic groups. 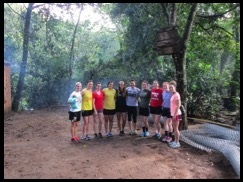 The main purpose of the trip was to empower girls through sport with the help of boys and men. 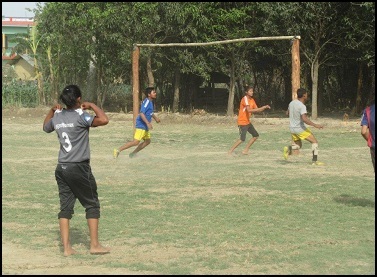 Our clinic and talks sought to integrate the girls with the boys on the field in some settings and in others it was girls only, providing opportunities for the girls to play where they usually are discouraged from participation. The conditions in Nepal, especially since the devastating earthquake in April 2015, are extremely challenging for all, but especially young girls. 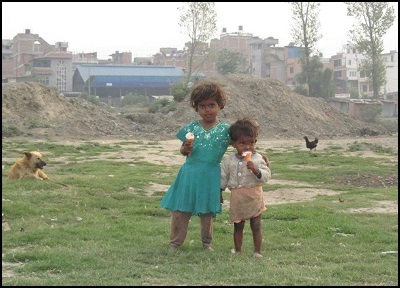 Life in Nepal as a young girl is hard. Obstacles include malnourishment, lack of access to clean water, inconsistent access to school (earthquake damage, distance to school is too great, having to help tend livestock, being considered “dirty” and shunned when menstruating, and having to care for younger siblings are just some of the reasons), no facilities to play, very little equipment, cultural pressure to marry at an early age (as a teenager), lack of infrastructure, and little to no support from family and elders in their community. Young girls, especially in the more rural areas, are a vital part of the work force in the household that determines if they family has food to eat, shelter, and water to drink. 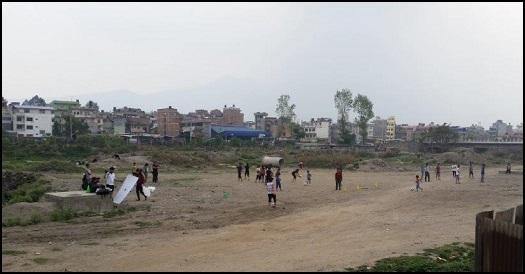 This was the ‘field’ for our clinic in the squatters village. NONE of these are issues for girls in our country. We take all of these things for granted and complain when coach doesn’t play us, when we get cut from a team, when our equipment is a few months old, when the field isn’t green enough, etc, etc. We live in a completely different world; one in which we have been granted every opportunity for success if we just simply chose to apply ourselves. And this is simply all by the mere chance of where we were born. Quite literally, as a female, we won the birth lottery by being born in the United States. Life here isn’t about survival, in our culture it revolves (for good and bad) around success (and how you choose to measure it). 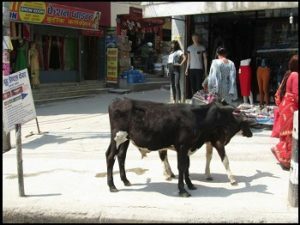 Life is clearly different in Nepal. Kathmandu is a densely populated city with a major pollution problem. There is a solid haze of pollution that sits in the valley and we didn’t have a single clear day the entire 2 week period I was in Nepal. 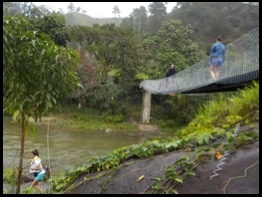 Severe poverty, sanitation, and infrastructure are very real issues that are apparent everywhere you travel. Yet despite their environment there is hope and a willingness to work to overcome the challenges. The young men (players, student, coaches, and community leaders) we crossed paths with all understood the importance of the role of women in society and were supportive of creating opportunity for marginalized girls to have access to education, sport, and leadership opportunities. We worked with some incredibly motivated male leaders that are making a BIG difference in the lives of girls in Nepal. They understand that for their society to improve women play an equally important role. Having men in leadership roles that respect women and are supportive of girls and women is such a key ingredient to change and that is happening. All the children we worked with were respectful, engaged, and excited to have the opportunity to play. Especially the ones living in the worst conditions, a squatter village right that bordered on the city trash dump. The ones that should have the least hope had the biggest smiles of pure joy. The youth of the country are pushing to become more involved politically, they are more inspired to stay in school with parents who understand the value in their education (boys AND girls), and are fighting for their voices to be heard. It is not about changing the culture or abandoning their history. It is not about westernizing their society. There are values and traditions that should not be lost. We are not right and they are not wrong. It is about sharing ideas and learning from each other. It is about broadening horizons, creating access to education and opportunities, and empowering young girls by giving them a voice and showing them that they have choices in their lives. I am incredibly thankful for the opportunities I have for cultural exchange through Sports United. I always gain such perspective from the tremendous people I meet wherever I travel. 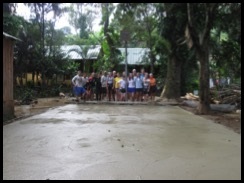 …and after with new basketball court! Emily committed over 60 hours of her time this past summer volunteering for OpenDoors of Asheville and has continuing with them this winter during her holiday break. OpenDoors is a local non-profit organization that provides support for children of multigenerational impoverished families. They raise money to send these children to summer camps, private schools, tutors, etc. Emily’s main role was to file and organize personal information and data the organization recorded for each of the children and their families that they were helping. She also catalogued the media information they collected concerning research on children of poverty. 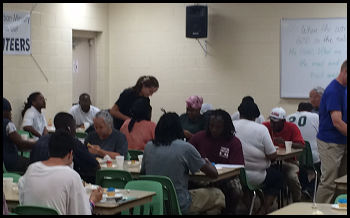 Emily did have a few opportunities to interact directly with the recipients of OpenDoors assistance and that is when she felt that the experience had its biggest impact on her. On occasion she was able to go out into the neighborhoods of the people they help, meet the families, see their homes, and how they lived. It was then that she realized the importance of the mission of OpenDoors; that these children do need help to break free from the cycle of poverty and that OpenDoors is changing these kids’ lives. Emily also shared that she hopes to volunteer again this coming summer of 2017. This was the third year that Kaylin volunteered at the Cabarrus County Special Olympics Spring Games. 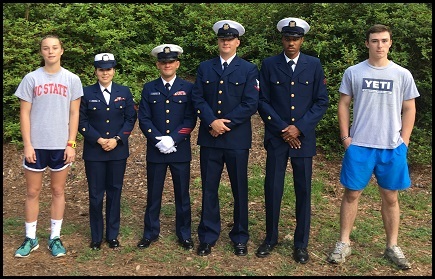 She spent 5 hours on April 14th along with a group from school helping the event run smoothly for the athletes and make it a memorable day for them. This year, Kaylin’s group was in charge of part of the Olympic Village where the athletes would play games and do fun activities when they weren’t competing. She assisted athletes in creating their own medals using stickers, markers, stamps, or cutouts to decorate and make their medals special. Kaylin said it was a wonderful experience and that helping all of the athletes throughout the day was inspiring because she witnessed up close how each athlete was unique, but more importantly she saw how much fun they were all having. 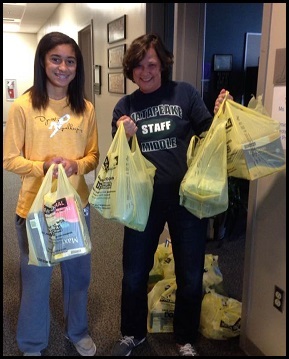 Overall, Kaylin felt this was a fantastic opportunity and a great way to help others. Emmie volunteered for 3 hours along with her brother for an organization call Kayak for Warriors. They assisted at the event by laying out the trophies, carrying kayaks to and from the water for participants, and running times from the dock to the computer. Felicity (aka “Flick”) was very active in her community this year!! Shepherd Youth Ranch (4 hours) – Shepherd Youth Ranch’s mission statement is “To provide restoration and hope for children and their families who have suffered trauma through the unconditional love of Christ and a unique relationship with horses.” At this event, Flick help set up and clean up a fundraiser in which people from the community came to enjoy games and talk to the occupational therapists and horse trainers. We also helped manage the activities. “I really enjoyed visiting this ranch; the owner gave a speech at my school, so we have become good friends. I also really love animals, so I admire what their ranch is doing. 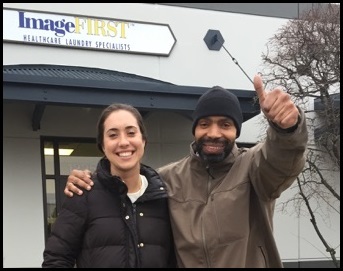 Through an organization called Families In Need Madi helped support over 30 families in need from West Virginia where 70% of the population lives at or below poverty level. She brought health and beauty supplies to the coordinator at the local middle school, who as you can see from the photo was so grateful for the donations! 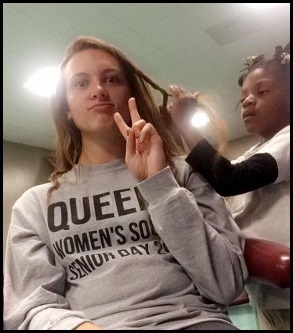 Georgia volunteered as a camp counselor this summer for 25 hours at the VBS Camp Memorial Drive Presbyterian Church Summer Celebration. Her main roles were to lead bible study and play games with kids during the week. In addition she also volunteer as part of T-shirt crew at the Wendall Family Fireworks 4th of July Celebration for 8 hours. Molly started a club at her school called Voices for Veterans. 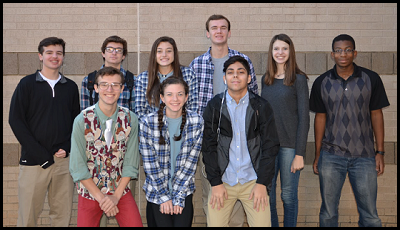 The motto is “Raising support and awareness for our veterans.” They have roughly 20 members and Molly serves as President of the club. 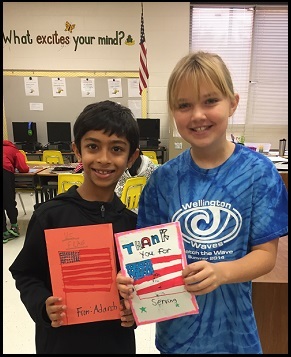 This year, they put together a 9/11 ceremony, Veteran’s Day Ceremony, and are currently working on holiday care packages to send to troops overseas. These will include snacks, candy, toiletries, and other goodies to say thank you to our troops. 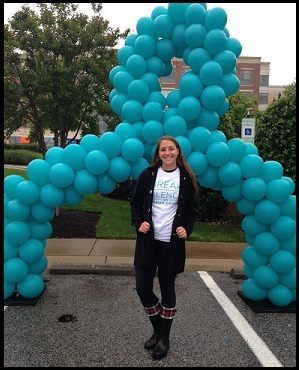 Ashley volunteered with two organizations in her local area this past May. The first was Vestavia Hills Elementary at Liberty Park. She invested 10 hours over two days on May 25th and 26th running two stations at an end of year celebration as well as organizing books in the school’s library. 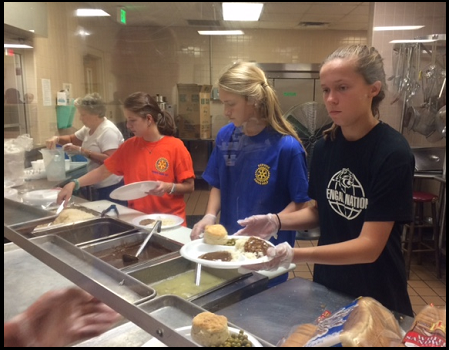 The second volunteer work she did was at the Country Club of Birmingham on May 30th. She committed 7 hours of service assisting the lifeguards and running games in the pool for children ages 2-13 years old. In addition Jonelle joined another school club this year called Green Team which focuses on recycling around the school. Every week, she spends about an hour collecting all of the recycling around the school with her friends who are also in the club. They have even gone paddle boarding with Green Team to pick up trash along the intercoastal! 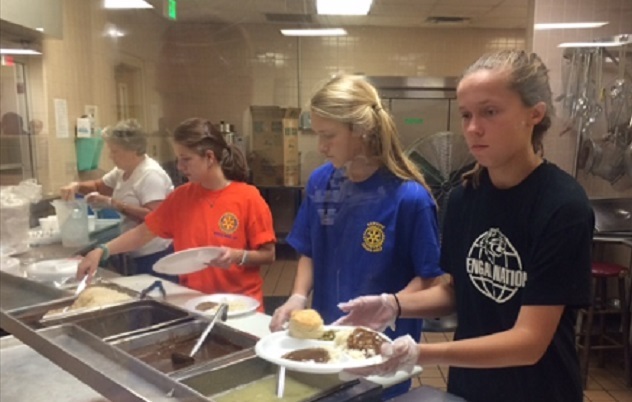 Emma started a non-profit organization with her father this past summer. Emma comes from a small town on the eastern shore of Maryland and very few girls in her town play soccer. And as you can imagine very few play goalkeeper. Typically goalkeepers like Emma have to drive 45-60 minutes (one way) to get a proper training session and once school starts it becomes increasingly difficult to have the time to squeeze that into an already full day. So Emma asked the girls in her area if they wanted to come out to the fields and train with her. She said the excitement in the responses she received was overwhelming. Emma said, “These goalkeepers want to learn and want to be the best they can be. Who would I be to deny anyone the opportunity to be better?” So with the knowledge and experience Emma has gained from her years at Dynasty, college camps, and her own private training sessions she hopes to help guide her local group of girls to becoming better goalkeepers with a better chance of advancing on to playing collegiately as Emma will be soon.